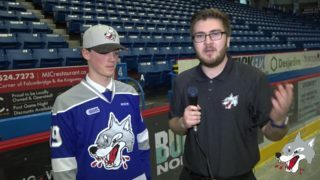 It was a divisional match-up Friday night at the Sudbury Community Arena as the Wolves took on the Barrie Colts for the first time this season. 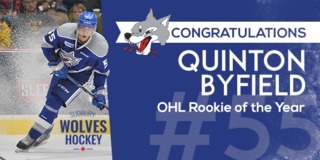 Defenceman REAGAN O’GRADY was the overtime hero in this contest as the Wolves took a wild 5-4 win over the Colts. Both teams exchanged goals in the first period of play with Captain KYLE CAPOBIANCO scoring his first goal of the season three minutes into the game. ROY RADKE answered back for the Colts to tie the game at 1-1 after 20 minutes. Shots on goal after the first period were 20 -3 in favour of the Colts. It was double trouble in the second for the Colts as DARIAN PILON and DRAKE PILON both beat CHRISTIAN PROPP, in fitting twin fashion, to give the Wolves a 3-1 lead. After a scrum in front of Wolves goalie JAKE MCGRATH, TYLER TUCKER capitalized on the power play and cut the Wolves lead to 3-2. Minutes after Barrie Colts’ goal, OWEN LANE made no mistake on the penalty shot and gave the Wolves a 4-2 lead heading into the second period intermission. Shots on goal at the end of the second were 31-21 for the Colts. 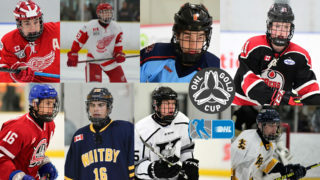 The Colts continued to apply pressure in the third scoring two unanswered goals from LUKAS CHIODO and a shorthanded goal from JAMES CORDELL to tie the game up at four goals apiece. 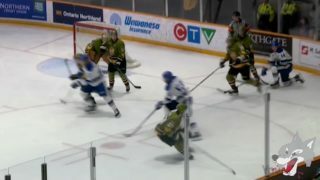 The Wolves had fans at the Sudbury Arena on their feet as the game went into overtime. It took a total of 12 seconds of overtime for O’GRADY to beat PROPP to give the Wolves their second win of the season. 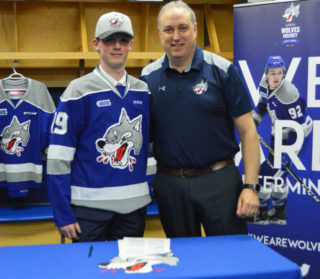 MCGRATH was solid in net for the wolves, stopping 43 shots in total for the win. Final shots on goal were 43-27 in favour of the Barrie Colts. The Wolves are back in action on home ice to close out their first double-header of the season on Sunday afternoon when the Kitchener Rangers visit for the only time this season. Game time is 2:00pm. 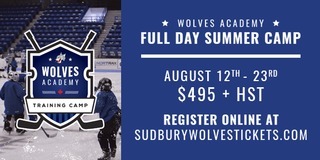 Tickets are on sale now at greatersudbury.ca/tickets or at the Sudbury Arena Box Office beginning at 11am on Sunday. Come out early as there will be live entertainment from Naked Soul, face painting and a free BBQ for season ticket holders. All kids 12 and under accompanied by an adult will received admission for only $10.00. The festivities begin at Noon. *Season Ticket holders are reminded that they must have their VIF Card in order to receive their free hot dog and drink.